A national leader in the tourism industry, Mary has been CEO of Destination Cape Breton Association (DCBA) for six years. In this role, Mary’s responsibilities are all-encompassing; developing, facilitating and leading with industry and community influencers regionally, provincially and nationally to ensure that Cape Breton capitalizes on building and promoting the Island as one of the top tourism destinations in the world. The Island’s national and international travel awards and accolades are a testament to Mary’s business savvy and her ability to mobilize stakeholders at all levels, to build a strong and healthy economy, through the flourishing tourism industry on Cape Breton Island. For over 25 years, Mary has played many roles in the tourism industry, working in the areas of management, marketing, and project management. A poignant chapter of her career was overseeing the development of The Canadian Museum of Immigration at Pier 21, helping to shape the Museum into the seminal national historic site that it is today. Throughout her tenure there, countless initiatives, precious moments and even more inspirational people marked her time with Pier 21. She understands the importance of honouring our past and saying thank you – two elements that have enriched her life tremendously. 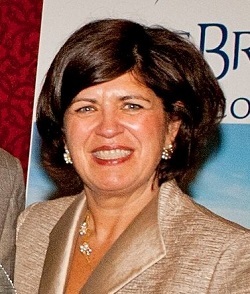 Mary has also held senior management positions with many tourism organizations, including Check-Ins Nova Scotia. While primarily focused in Nova Scotia, she has worked throughout Atlantic Canada as a consultant and managed projects. Closer to home, her consulting portfolio also includes feasibility studies on many different projects that have impacted decision makers within various levels of government. Mary is passionate about the tourism industry and truly feels there is no product quite as exceptional and with as much new potential as Cape Breton Island. She describes the Island as a magical, mystical place. A collection of culture and raw beauty unmatched anywhere in the world. People choose to visit here and live here, sometimes one leading into the other. While bodies may leave either physically or spiritually – hearts never do. She believes that being able to stand on a beautiful piece of Canada - Green Cove - and reflect on those who fought will reinforce to all how blessed and fortunate we are to be Canadians and reinforce our gratitude to those that delivered our freedom to us.